Karl Barth's obsession with Wolfgang Amadeus Mozart is a well-known fact. He stated that upon reaching heaven he would "first of all seek out Mozart" before looking for his favorite theologians (16). Wolfgang Amadeus Mozart is a publication of essays and letters from the pen of Barth. There are no continuous themes beyond Barth's obsession with the childlike freedom of Mozart. The closing chapter is a speech delivered by Barth before a festival in honor of Mozart. Many of his lines seem destined to reflect life eternal — e.g. "No laughter without tears, no weeping without laughter!" (54) and "Joy overtakes sorrow without extinguishing it" (55). 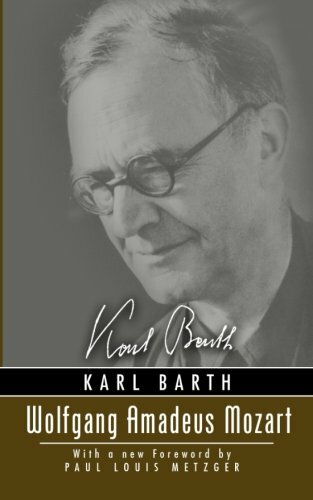 Barth's theological emphasis on freedom translates to a vast appreciated for the freedom of Mozart's music which "renders the true vox humana [human voice]" (54). Yet in this freedom, Barth notes "sovereign submission…as a distinct feature of what was unique and special in this man" (51). Mozart is painted beautifully. Barth's theology imprints itself ever so mildly. In conclusion, Wolfgang Amadeus Mozart is a fine little book. It is no comprehensive work on Mozart or Barth. It is a small window in the world of Barth and little more. But a precocious and sportive look it remains.